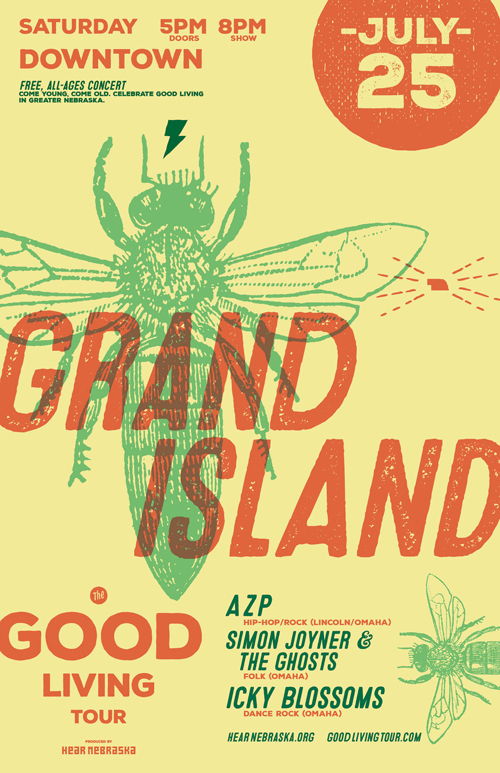 OMAHA, NE (May 6, 2015) – Hear Nebraska and local organizers are pleased to announce an outstanding lineup for the Saturday, July 25 Good Living Tour concert finale in Grand Island. Three outstanding, sonically diverse bands — each with new albums — will play a free, all-ages concert outdoors in downtown Grand Island. Omaha dance-rock band Icky Blossoms (touring the country currently with indie rock stalwart Of Montreal) will headline the concert, joined by legendary American singer-songwriter from Omaha Simon Joyner (playing with backing band The Ghosts, which sometimes includes Grand Island natives Megan Siebe and David Nance), and the sonically diverse hip-hop/rock band AZP. Grand Island Convention & Visitor's Bureau, The Nebraska State Fair, and Downtown Grand Island have been critical partners with project organizer Hear Nebraska, providing vision, leadership and funding to help bring the Good Living Tour to Grand Island. "The Grand Island Convention & Visitors Bureau is thrilled to help bring Nebraska bands to our city," says GICVB Marketing Manager Paul Nielsen. "We hope this concert serves as a launch pad of sorts to boost the musical culture in Grand Island. We know the talent is out there in our community, and we want to help give it a platform for success. The Good Living Tour is an inaugural concert series hosted in nine communities across Greater Nebraska, July 17-25. It’s also an accompanying community storytelling/marketing project aimed to communicate the benefits of living in Greater Nebraska to a young audience — statewide and around the world — through social and traditional media. A total of 27 Nebraska bands will perform family friendly sets over the nine-day tour. Each concert, carefully curated by Hear Nebraska, features three contemporary groups, representing a diverse mix of musical genres and styles — from indie rock to hip hop to country to blues. The concert is FREE, family friendly and all ages are encouraged to attend. The event features food and beverage vendors. Doors open at 5 p.m., with bands beginning at 8 p.m. Comprising three multi-dimensional artists, Derek Pressnall, Nik Fackler and Sarah Bohling, the Omaha dance pop band Icky Blossoms is known for the trance-inducing, rhythmic experience of its albums and live shows. After playing SXSW 2015, the band has continued its recent national touring, including dates with the indie rock stalwart Of Montreal. Icky Blossoms released its first album on Omaha's Saddle Creek Records in 2012 and a follow-up, Mask, drops this May. Releasing 13 studio albums, founding two of his own record labels, occasionally touring the world and raising a family all while living in Omaha doesn’t mean legendary songwriter Simon Joyner shorted his dreams. Maybe he was just aiming somewhere different the entire time. Joyner, who performs regularly now with his band The Ghosts, is known internationally as a DIY and songwriting legend. Regarding the release of his new album, Grass, Branch and Bone, famed songwriter Gillian Welch calls Joyner "my favorite poet." Combining hip-hop, soul and rock, AZP bandleaders Zachary Watkins and Ishma Valenti thrive on battle lines: good and evil, light and dark, empowerment vs. exploitation. Their first EP, Early Sunday Morning, touted not only the grandeur of Watkins and Valenti’s vision, but showcased them working together boundary-pushing musical ways. AZP's new EP, Red Moon, is out this May.